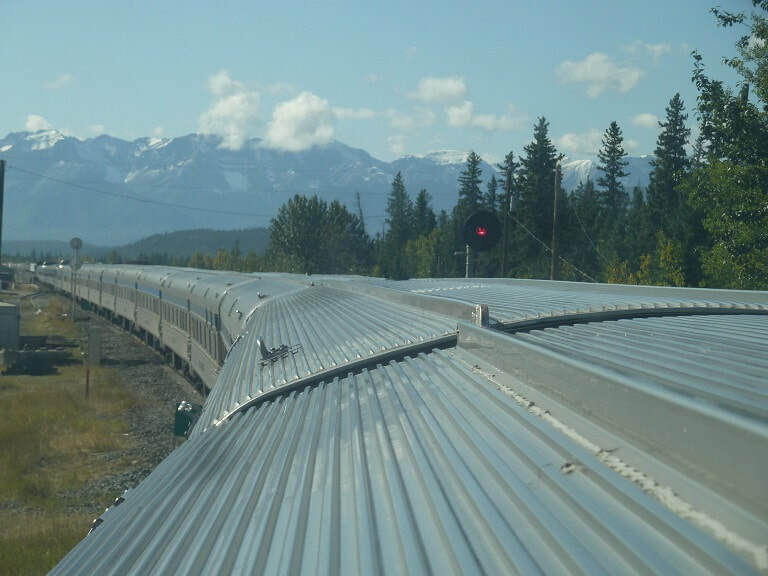 The Canadian –Exploring Canada by rail. 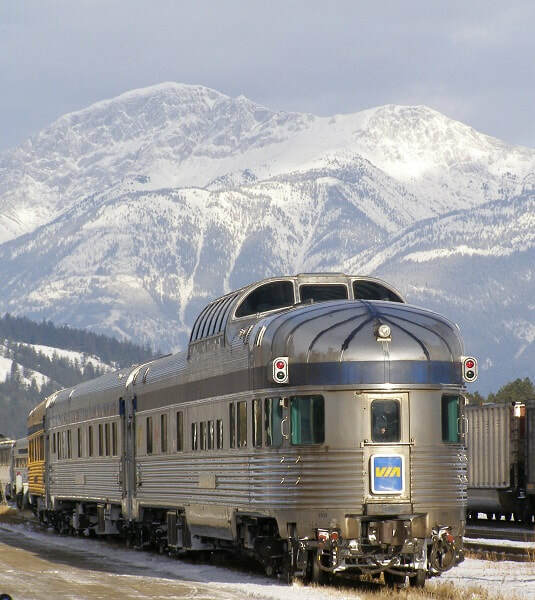 Like Australia's Indian Pacific, Canada's transcontinental version - the Canadian - is one of the world's great train journeys. But there's a marked difference in the scenery from sunburnt, dry plains in Australia to dense, towering boreal forest and countless shimmering lakes and rivers in Northern Ontario, the vast Prairies of Manitoba and the towering peaks in the breathtaking Canadian Rockies in Alberta. And there's much more, writes features editor, John Newton. 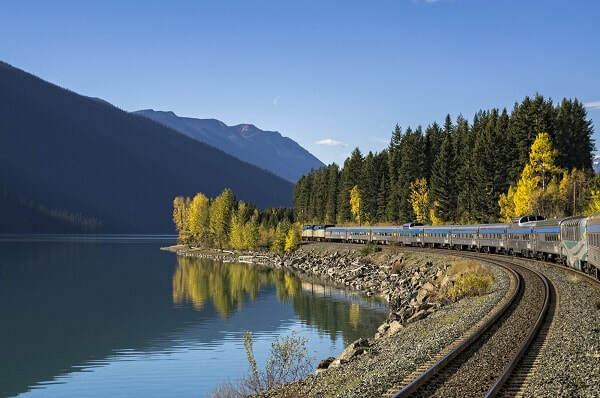 Via Rail's flagship - the historic Canadian - covers 4466 kilometres between Toronto and Vancouver (and vice versa) in 83 hours or three days and four nights – that's if it's not delayed by freight trains. Not that this is a problem unless you have a tight connecting flight or cruise at the end of the line. Long-haul rail travel in Canada can be romantic, relaxing and exciting, so intermittent stops for giant freight trains, some almost two kilometres long, should not detract from the unique thrill of travel by train. After all, freight railways are the lifeblood of the North American economy – and they have the right of way over passenger trains. 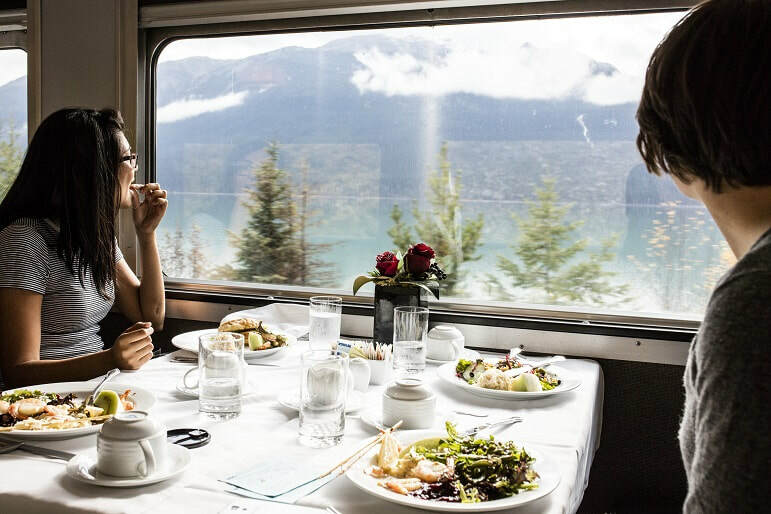 The Canadian's stainless steel rail cars have been spruced up with a CAD$22 million upgrade and feature three accommodation classes – Economy, Sleeper Plus and Prestige Sleeper. My cosy Sleeper Plus cabin – with two bunk beds – also had its own toilet and wash basin with a shower facility next door. 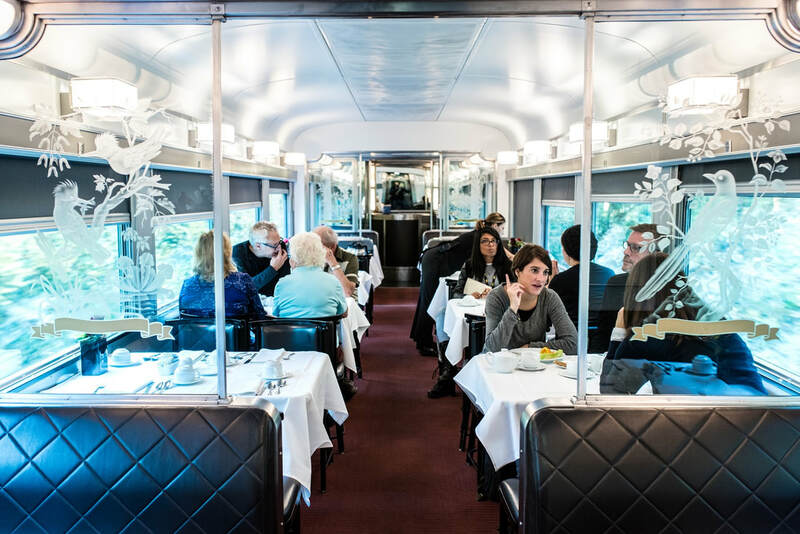 Reservations in the dining car with meals prepared on board by VIA Rail's chefs. My journey aboard the Canadian started in Toronto, where I was eager to jump aboard and unwind after a 30-hour marathon on three flights and waiting for airport connections en route from Perth to Ontario's bustling capital city. It was late at night when the two 'iron horse' locomotives began hauling the 20-odd rail cars from Toronto's vast station and the train's gentle rocking motion soon put me to sleep. By morning, the sprawling city had been left well behind, and it was time to grab a seat in the Panorama rail car for sweeping views – at a leisurely pace - of the gorgeous lakes and rivers shadowed by the emerald green forests of Ontario stretching past the border with Manitoba. On the Manitoba side, the 200 lakes of Whiteshell Provincial Park – some of which were formed by meteor craters – offer some of the best northern pike, perch and trout fishing in Western Canada. First major stop is Winnipeg, Manitoba's capital, where Union Station is one of the city's stand-out buildings. The grand beaux-arts structure was designed by the architects responsible for New York's Grand Central Terminal. After two nights aboard the Canadian, passengers get a few hours in Winnipeg to stretch their legs at The Forks - a trendy shopping, eating and meeting place, market and festival hotspot, located at the confluence of two major rivers - the Red and Assiniboine. Renowned as the geographic centre of Canada and North America, Winnipeg is a vibrant city with more than 6000 years of history as a result of its significance as an indigenous meeting place. You can discover The Forks' hidden history – and uncover what lies beneath your feet – on a guided walking tour, with plenty of time to take in the sights before the train leaves. Winnipeg is the 12th of 34 points of interest over the three-day east-west journey, which includes Biggar, a tiny town in Saskatchewan with a population of just over 2000 that prides itself on its sense of humour. Its slogan is: 'New York is big, but this is Biggar'. Further along the line another small town called Viking was aptly named because of the many Scandinavians who settled the area in the early 1900s, while Edmonton, Alberta's capital, is regarded as the gateway to the north as it was the staging point for adventurers and explorers – from the early days of fur trading to the Yukon gold rush and the Alberta oil discoveries of 1947. 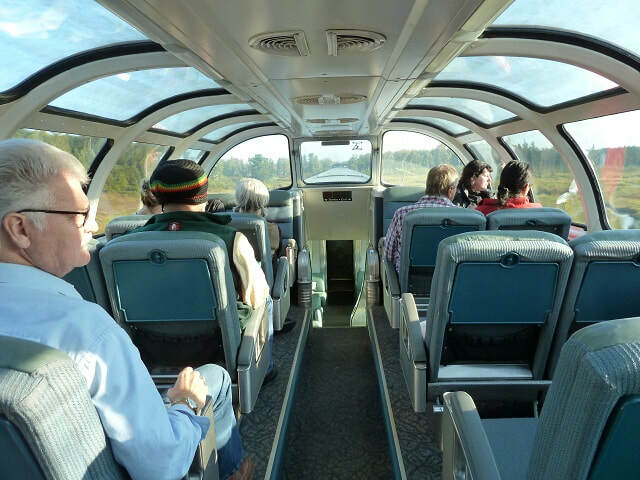 There was an air of excitement as the train left the early morning fog of Edmonton bound for the majestic Canadian Rockies. The rush was on for the best seats in the panoramic dome rail cars. And those lucky enough to get one didn't move until the train pulled into Jasper. The scenery just keeps getting more picturesque as the train crosses one of Canada's most historically significant rivers, the Athabasca, the seventh longest river in Canada, originating at the Columbia Icefield in Jasper National Park – the largest mass of ice south of the Arctic Circle. 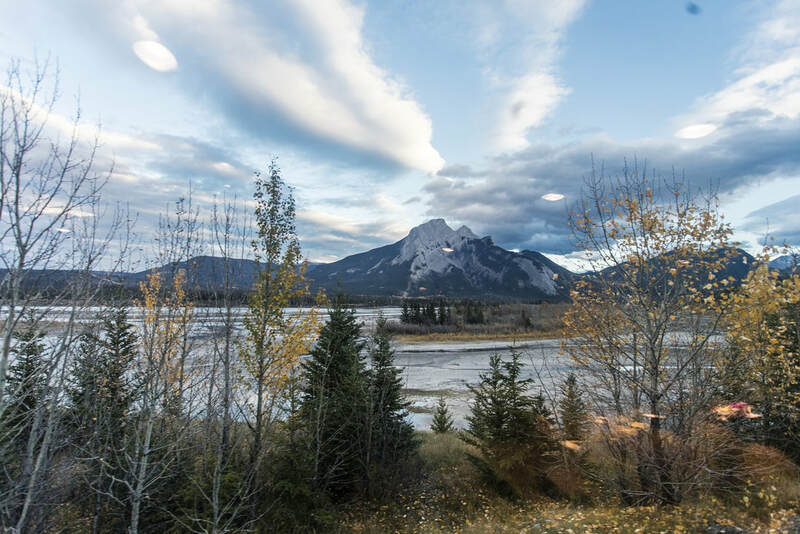 And the gasps get even louder as the 225-metre long tunnel beneath Disaster Point brings the train into the largest park in the Canadian Rockies, spanning almost 11,000 square kilometres. 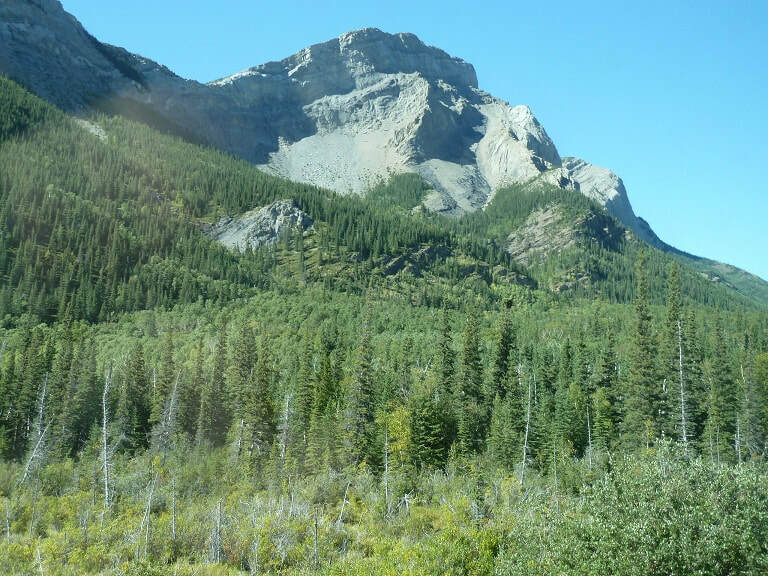 Even in September, there were snow-capped peaks, while just a stone's throw away from Jasper town centre, elks were feeding along the roadside with an odd bear or two scavenging along the rail track in search of grain that had leaked from freight trains. Jasper is also the starting point for Via Rail's Prince Rupert bound train, also known as the Skeena, which I planned to jump aboard after a couple of days in the world-famous ski and wildlife destination surrounded by lakes, rivers and mountain ranges. After three nights aboard the Canadian, it would be remiss of me not to mention the energetic, enthusiastic and excellent staff aboard the train, which made the spectacular journey as good as it gets. You certainly won't go hungry on the Canadian, with three high quality meals a day prepared by on-board chefs. At breakfast, for instance, you could choose a Transcontinental (two eggs, prepared any style) with hash browns and bacon, ham or sausages, served with toast or a fresh-baked muffin, or blueberry pancakes. And for lunch, there were four choices. Such as a bison burger or salad with grilled salmon, while for dinner there were also four choices, like Canadian lake trout or chicken with wild mushrooms. And if you are still feeling peckish, there's free coffee, tea and juice, plus muffins, croissants, fruit and biscuits when the dining car is closed. Disaster Point was named by a Canadian Pacific Railway surveyor, who broke his whiskey flask there in 1872. The Canadian doesn't just carry a human payload. It's also been known to carry lion cubs in the baggage compartment, according to Erin King from Winnipeg, who's an activity co-ordinator on Via Rail. And, she says, hunter's often bring aboard the game they've killed – and that, too, is despatched to the baggage area.